The Dolphin Gold Slot by Lightning Box Games is a five reels slot with four rows and 40 paylines. The underwater themed slot can be played from 40p up to a maximum of £ 60 per spin. Some exciting bonus features are available at the Dolphin Gold Slot. That’s included wild and scatter symbols, win multiplier and a free spins feature. The game not only looks great, but is also available on all platforms including smart phones and tablets. As always, you can also try this Lightning Box Slot for free. Other popular games from the Australian manufacturer are Chilly Gold or Silver Lion. Symbols and payouts: The Dolphin Gold Slot offers themed symbols and playing cards symbols from 9 to king. With combinations of 5 identical symbols, you can win up to 50x your bet. All combinations with the wild symbols Gold Dolphin and Blue Dolphin are doubled. The various see animals are your topic related symbols and pay up to 500x your bet. Again, you can grab double profits if you land wild symbols on your reels. The feature is pretty exciting and lucrative on top. Free Spins Feature: One of the highlights at the Dolphin Gold Slot are the free spins. The Scatter symbol is of course the Gold Dolphin which has to land on the reels 2-5. The symbol appears here as a stack of wilds. Thus, you can get up to 12 scatter symbols, which trigger the maximum of 21 Free Spins. Even within the Free Spins feature, your winnings are doubled in combination with the Gold Dolphin and Blue Dolphin symbol. Stella Jackpots: There is a progressive jackpot called Stella Jackpot at the Dolphin Gold Slot. You play for the jackpot if you make one extra bet per spin. There are 6 challenge levels and a jackpot level. Higher bets also increase your chances of winning a jackpot and the jackpot amount. You can trigger the Stella Jackpot Bonus in the free games. There is a mini, minor and major jackpot. You need 3 of the Jackpot symbols each to trigger the corresponding jackpot. 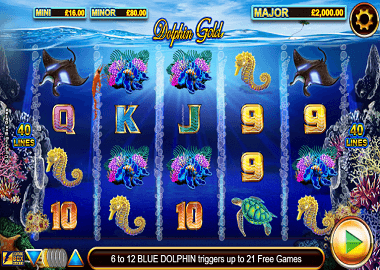 The Dolphin Gold Slot by Lightning Box Games is a solid game with increased entertainment factor. Not only can you grab nice winnings in the Free Spins feature, you can also trigger a jackpot – a great extra feature! Try the game here for free by clicking on the banner above. Of course, this game is really fun when you play it in Online Casino. There are a few nice recommendations in the table below. You can start with some bonuses and free spins! You can find more free slots from well known slots providers like Netent, Quickspin, Yggdrasil or also ELK Studios on our Freeplay page – enjoy!